There’s a new Funding & Tenders Portal replacing the Participant Portal. The Participant Portal was built at the beginning of Horizon 2020. The scope was for the EU Research & Innovation Programme. However, as it’s use grew to other EU programmes, there was a need to re-brand the portal. The new portal will become a central point of access for most (all?) EU programmes, including tender and procurement contracts. The question is, by having a portal with a much broader scope: Will scientists be able to navigate the new portal efficiently? In most software based projects a broader scope introduces more complexity. The European Commission has published that Horizon Europe will be the follow-up programme to Horizon 2020. The plans are for a €100 billion research and innovation programme. Horizon Europe will start on 1 January 2021. In the next years this proposal by the European Commission will be worked out. Until then: Good luck with your Horizon 2020 proposals. October 2 – 6, 2017 a Horizon 2020 virtual Summit will take place online. Nikolaos Floratos, a funding expert and trainer from Greece, organizes the summit. Nikolaos recorded interviews with EU funding experts on different topics, ranging from ERC grants to FET and SME instrument grants. The virtual Horizon 2020 Summit is free to watch, and you have to register beforehand to view the interviews. You can get a ticket here: Get your free pass to Horizon 2020 Virtual Summit. The summit is basically an online event, allowing you to see recorded interviews with experts on Horizon 2020 and related areas. There are a lot of different topics covered, and it’ll take some effort to be available when the interviews are online. However, I really recommend to watch the interviews on your topic of interest. 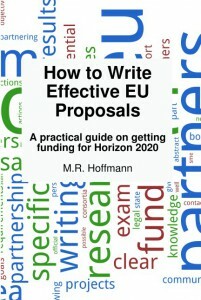 You can also watch an interview with me, Marc Hoffmann, covering mostly the information in the Horizon 2020 proposal handbook. My advice is to prepare to hear advice from different perspectives. Each expert has his own experience and recommendations. What works best with ERC individual grant proposals might not work well with a larger Horizon 2020 consortium. The summit is organized through the company KEY INNOVATIONS as a commercial activity, and they also sell tickets. Writing a book is hard work. After the book was finished, I got much valuable feedback from readers who contacted me. Some readers are very happy how I helped them in getting started with Horizon 2020. These readers took the initiative in sending me an email. Now it’s my turn in asking: I have set up a NPS feedback system. The reason I have started to collect feedback through a simple NPS (Net Promotor) survey is that I want a system with not much effort for my readers. When you visit the Horizonbook website, a short survey appears for some visitors. Horizon 2020 has broken the funding application record of FP7: 140.000 funding applications have been submitted (see http://sciencebusiness.net/news/80171/Less-than-halfway-in-Horizon-2020-has-received-as-many-applications-as-FP7 ). These high application rates imply that the overwhelming majority (nearly 90%) of funding applications never get any funding! As a result, low funding rates frustrate applicants, because preparing a proposal is a significant investment. It is probably true that applying for Horizon 2020 became easier, however getting financing became more difficult. This is also an observation I made in relation to writing a book on Horizon 2020 proposals: horizonbook.eu. Writing a proposal is not hard, writing a good proposal is hard! There is much advice going around on writing successful proposals for Horizon 2020. Much is common sense, and most experienced participants have their own specific strategies for partner search and proposal preparation. However there were not many data points available on what problems and obstacles newcomers to Horizon 2020 faced. I prefer to give advice based on data, and have conducted a Horizon 2020 survey. 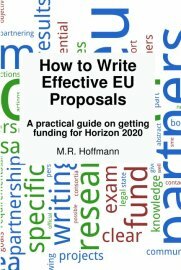 Before writing How to write effective EU proposals I asked about problems in applying for Horizon 2020 funding. The survey results say that finding partners is the biggest obstacle Horizon 2020 applicants face, indicated by 75% of the respondents. And another 45% said networking is difficult. I had an idea of what applicants find difficult, but I wanted to hear what others think about the Horizon 2020 application process. Therefore I conducted a survey to understand the difficulties faced by Horizon 2020 applicants. Many Horizon 2020 newcomers feel overwhelmed by the complexity of applying for Horizon 2020. On the other hand, experienced proposal writers often see Horizon 2020 as a challenging, but well-known proposal writing competition. This dual view originates in the curse of knowledge: Once you are an expert in an area, you “forget” how it feels to start to learning. This has the unfortunate consequence that advice by experts is often less usable by novices (while still being helpful for intermediate learners). To address this problem in Horizon 2020, I conducted a survey about what is perceived as most difficult in Horizon 2020, and which applicant skills need most improvement. I also asked which applicant skills need most improvement1. Here the answers were different: a whopping 70% said that writing skills needed improvement, with only 55% stating networking. The answer was clear: 96% recommended such a book. Because many applicants feel lost. H2020 is too complex for newcomers. It should be an effective guide to how to start the process. proposal) is preventing many from participation in H2020. These answers show that a book on Horizon 2020 should focus on an simple, understandable introduction to Horizon 2020. The contents should help with finding partners, networking and proposal writing. The book “How to write effective EU proposals” could be the solution to these problems. The book was written to address the issues the survey uncovered. Although some results were to be expected, the survey reinforced my view that starters in Horizon 2020 are overwhelmed by the information on the EU’s sites and lack a simple and clear introduction to Horizon 2020. Here is a short overview of most of the Horizon 2020 types of actions and their funding rates. The detailed description of the types of actions are described in the General Annexes of the Horizon 2020 Main Work Programme and in the ERC Work Programme. Keep in mind that these numbers can change! Additionally there are so called “H2020 Calls for Tenders”, which in effect is European public procurement and publishes calls for tenders. In practical terms the EU provides funding through Horizon 2020 and at the same time requires trans-European cooperation. As an applicant you have to work together with partners from other European countries to get funding. By building up personal and organisational networks in this way, the EU programmes promote a European community in practice. In practice Horizon 2020 provides (co)financing and networking benefits to participants. The financing can be up to the 50 – 100% of the net cost of an R&D project. The financing is calculated on the basis of direct costs associated with the research. These costs do not include commercial profits, but cover such things as personnel cost, costs of materials and travel. On top of these direct costs a fixed overhead rate of 25% is applied, giving the total eligible cost. This total is then refunded at a rate of between 50 – 100%. You can participate in and get funding through Horizon 2020 if your organisation is based in the EU or a country explicitly allowed to participate. The amount of funding you can get depends on the specific funding rules, the legal status of your organisation and your contribution to Horizon 2020. What are the success rates for proposals in Horizon 2020? It was hard to get an overview of the success rates of proposals in all calls in Horizon 2020. In September 2015 the European Commission’s Director-General for Research and Innovation, Robert-Jan Smits, told that success rates are between 12 – 14%. That figure is an overall rate for Horizon 2020, and thus varies in between different calls. This success rate is much lower than in FP7, the previous research programme of the EU. Unfortunately this means that many applicants waste their time in preparing a proposal. On the other hand, the low success rate is probably in part a reflection of some researchers reusing their proposal texts for multiple calls. The report “Horizon 2020 – First results” has aggregate statistical information on success rates as percentage of eligible applications: Horizon 2020 compared with FP7 on page 15. For all countries the Horizon 2020 success rate is much lower than the FP7 success rate. What is stands out from the results (page 16) is that Public Bodies have a much higher overall success rate than other classes of applicants. I speculate that this is because Public Bodies are not under so much external pressure to get Horizon 2020 funding, and so decide to submit a proposal only if they have a high chance of success. It is also noteworthy that newcomers (i.e. first time applicants, which also didn’t participate in FP7) had a relatively high participation in signed Horizon 2020 grants (page 25). Given the low overall success rate, what can you do to increase your chances of getting funding? Probably the simplest method is to write a short one-page proposal and get external (and critical) feedback on it before embarking on a full proposal. Want to know more? Get the book. Posted on September 28, 2015 September 5, 2016 Categories UncategorizedLeave a comment on What are the success rates for proposals in Horizon 2020? In some Horizon 2020 calls evaluation criteria have changed. It seems that the evaluation criteria have begun to vary more and more by call, even within the same funding mechanism. Reviewers are now sometimes explicitly forced to address each of the sub-criteria in an online form. It is not yet clear how common this is. If you have experienced this, please leave a comment! Online call templates for Horizon 2020 calls are sometimes updated when the call is open. So make sure you download and use the latest templates from the participant portal shortly before submitting your proposal. It can be a hassle if you prepared the final version of your proposal with an older template from the electronic submission system, and need to update it stressfully while the deadline approaches.